Ufford Park Hotel is situated just outside the town centre but offers a wide range of on-site facilities so you may not want to leave! The hotel is set within 120 acres of beautiful countryside, overlooking the Deben valley, and there are 87 ensuite rooms of varying sizes to choose from, many with balconies overlooking the surrounding countryside and golf course. The restaurant also has fantastic views over the 18 hole golf course and the bar is relaxed and informal, serving a good selection of drinks, and leads on to the more active sports bar complete with pool table and large screen television showing all the latest sports action. In between the restaurant and bars is a quiet lounge area where guests can meet up with friends or relax in the peaceful atmosphere before dining or retiring to bed. Families are welcome in both the restaurant and areas of the bar. 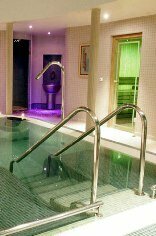 The Health Club at Ufford Park includes a huge gymnasium, swimming pool, a luxurious spa and trained beauty therapists. 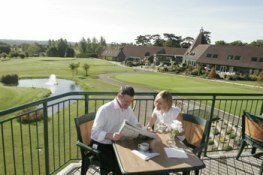 The hotel offers a range of Activity Break packages, such as Golf Breaks, Leisure Breaks, Spa Breaks and Bird watching Breaks, amongst others, and also has a Wedding and Civil Partnership license plus various rooms available for corporate hire. Please see Ufford Park Hotel, Golf & Spa for full details of the facilities and to make a reservation. In the main market square in Woodbridge you can find The Bull Hotel & Restaurant which is a family run Hotel, and just outside Woodbridge on the A12 is The Grove House Hotel which has a range of family rooms on offer. The Crown & Castle, Orford, a traditional 16th Century Inn with 18 stylish bedrooms and views of Orford Castle. Kesgrave Hall, Ipswich offers luxurious bedrooms with modern facilities and a bistro restaurant. For all of the latest deals from hotels in the area, please see Special Offers from Hotels in Suffolk. 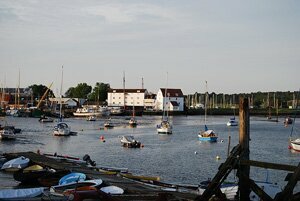 Amongst the vast tourist attractions in Woodbridge, visitors will discover the River Deben; Sutton Hoo - a Saxon Royal burial ship; the Woodbridge Tide Mill; and the Martlesham Heath Control Tower, to name but a few. Nature lovers will love the peaceful and beautiful countryside and perhaps enjoy one of the many guided walks available. For more details on the area including things to do, days out and "what's on", please see our Guide to Woodbridge. 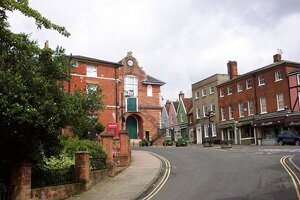 Finally, if you are planning a Woodbridge wedding please see Woodbridge Weddings and Receptions.